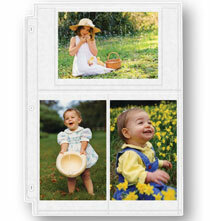 White Mylar® 3-ring sheet protectors protect pages and photos, with tucked-flap closures along the hole-punched edge. We enclose a sheet of heavy paper — both Mylar and the paper are archival. 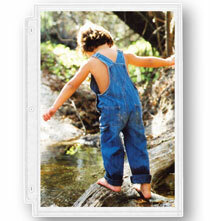 Simply affix your photos with one of the photo-safe adhesives available online, and insert into your sheet protector. I love pictures and albums! For all the years I have had a family, I have done photo albums. Now I am converting older albums to your to use the Non-acidic papers as have noticed that photos are fading. I feel your product website could be better. I am a real estate broker, and use websites for graphics, reports, gifts, etc. Sometimes yours is not user friendly. Organize all the many photos I have into beautiful books. able to put photos in different configurations . will accommodate different sises and shape photos and room to write notations. These pages give me the most versatility and variety for placement of my photos. 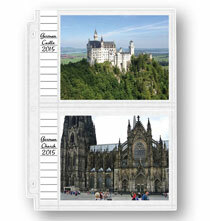 I put many photos, cut creatively, on each page and these pages are very easy to use. I've used Exposures albums and pages since 2000! Great quality and lasting. They work well for me and have for a long time. 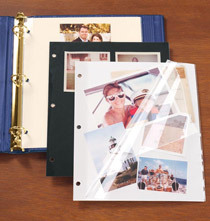 I have used these albums and pages for several years and find them the perfect solution for the different size photos used in my annual calendar of grandchildren photos. The flexiblity to place my pictures on a page. I want a quality product. Other items I have ordered from Exposures have been the quality I desire. The white pages look better than the black. I love the clear plastic covering of the page. can put any size of pictures. I have bought from exposures before and already have the album. I have ordered several of these albums in the past. They are beautifully made, the service is wonderful. Would recommend them to everyone. I've used these pages for years in my photo albums. Purchased photo albums from you 14 years ago and have been needing additional pages for a long time! These will match the existing pages. The pages are white and fresh looking against hte colored photos. All of the Christmas cards are different sizes, so I needed pages that could accommodate all different sizes. White is the prettiest color to show off your photos. They work best for what I need for the size of scrapbooks that I use. I wanted to be able to arrange the pictures rather than place them in pockets. I have used this Exposure product before and am satisfied with it. Been ordering these albums for 25 years!! size of photo holder in inches ? BEST ANSWER: Thank you for your question. This page is 9 1/4" x 11". Photos can be arranged at the customers discretion. We hope this information will be of help to you. How many 4x6 photos would fit on the page? BEST ANSWER: Thank you for your question. Because this has not defined inserts, the number of photos you could fit varies based on how you position them. We hope this information will be of help to you. Are there 10 black pages to go with the 10 sheet protectors? BEST ANSWER: Thank you for your question. To purchase the black Protector pages you will need to purchase item 339947 as these are only the white pages. We hope this information will be of help to you. How big are the Mylar 3-ring sheet protectors? BEST ANSWER: Thank you for your question. This page measures 9 1/4" x 11". We hope this information will be of help to you. will this hold an 8x10 photo? BEST ANSWER: Yes, easily. The distance from the outside edge of the sheet protector to the punched 3-ring holes is 8-1/2 inches. A 8 X 10 print will have a 1/2 inch border on the inner edge. The sheet protector is exactly 11 inches high so a 8 X 10 print will also have a 1/2 inch border above and below. Yes, I just measured a protector. 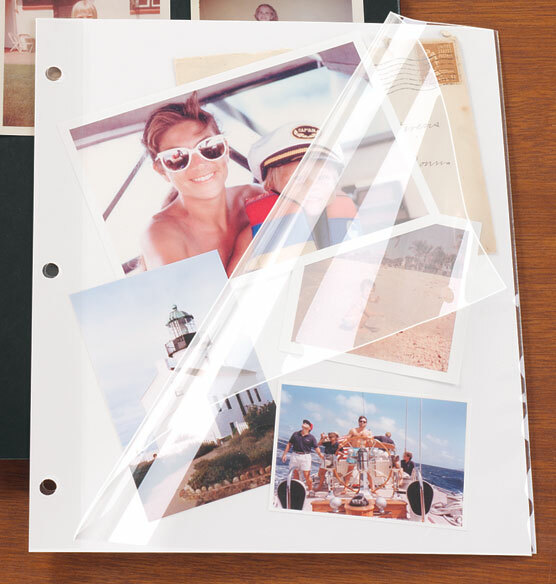 Just FYI it is a cover for a photo that goes into a binder, so the protector lifts away to receive the photo then you place the protector back over. An 8 X 10 photo. The quality is also very good. I see that the pages are described as "archival." Does that mean they are acid free? BEST ANSWER: I believe that acid free is relevant in the process of making paper, these sheets are what they say they are I use them with acid free paper to keep photos and special papers. Hope that helps a bit. Thank you for your question. The Mylar sheet protectors are acid free. We hope this information will be of help to you. How many pages are there for 12.95? BEST ANSWER: Thank you for your question. There are 10 pages. We hope this information will be of help to you. Is # 339948 what was previuosly # 309332 ? BEST ANSWER: Thank you for your question. They are the same item just different color. 339948 is White and 309332 is ivory. We hope this information will be of help to you.